Marilyn picked up the Bear Paw quilt from the longarm quilter and sent me photos of the quilting. 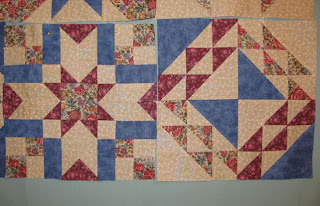 I personally like tighter quilting, but I think the pattern that she selected works for this block. 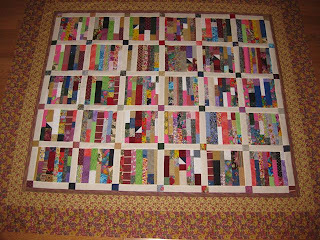 Extra quilting showcases the borders. 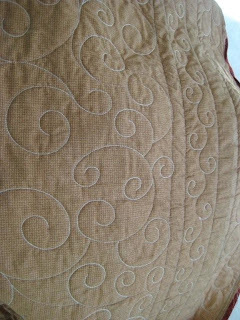 This view of the back, gives you a clearer view of the quilting. 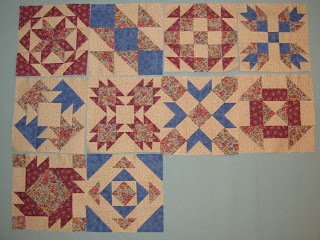 I'll be visiting my sister in a few days, so I can see the quilt in person and work on the binding. 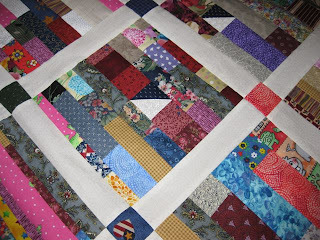 Once the binding is stitched, I'll post a picture of the full quilt. 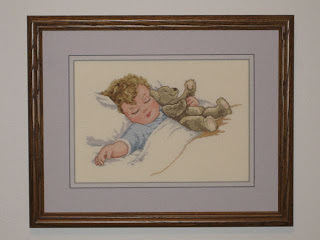 Over the years, I have done a lot of counted cross-stitch, and The Sleeping Baby is my favorite picture. I originally made it to be a birth announcement with name, weight, etc. in the bottom right corner for my niece, but sadly she did not have any children. 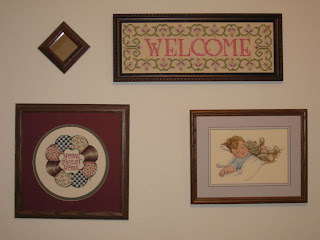 It hangs in my sewing room along with a picture made by my niece and a sign made by my mother. This Victorian House with the door sign hangs by my front door. The sign has Velcro on the back and is interchangeable to reflect the holidays or special occasions. The "Welcome Friends" sign is displayed between holidays. 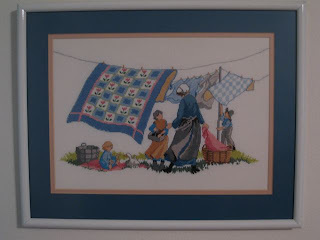 This piece with an Amish family at the clothesline is on display in my bedroom. 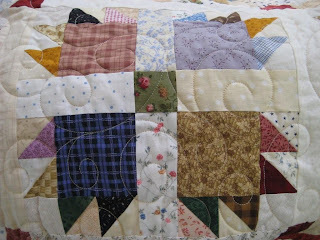 I especially like the colors and the movement of the quilts. It reminds me of hanging clothes when I lived on the farm. I also have a lot of Christmas and Winter counted cross-stitch pictures; perhaps, I will remember to post photos of them when I hang them in November. I don't know why this counted cross-stitch project was never finished. It was started in the early 1990s and was intended as a Christmas gift for my pastor and his wife. Intended is the key word, yet in reality, my intentions did not manifest into a framed picture. At the time, I was working full-time and could work on it only in the evenings. 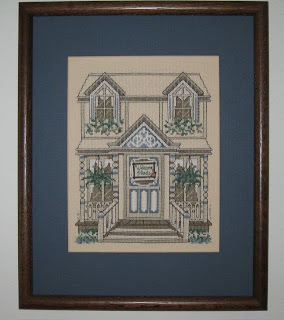 The thread count on this piece is 22 stitches an inch which requires good lighting and sharp eyes. Time has passed, and my eyes are not getting any better. I really want to finish this piece, so I am working on it again. My goal is to finish it by the end of August. When I was searching for some of my mother's unfinished projects, I found one of my strangest collections. I am sure that you will find it peculiar as well. 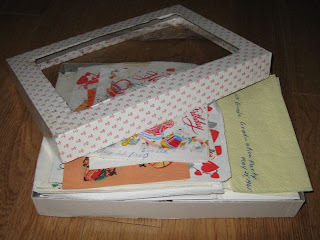 This box contains napkins from my childhood. Yes, you read that correctly: I said napkins. Why would anyone save napkins? Well, let me explain. . . I did not start this collection. You might say that it adopted me. 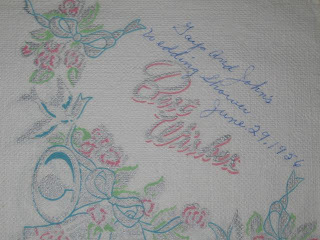 The oldest napkin in the box is from my eldest brother's wedding shower (June 29, 1956) as chronicled by my mother's notation on the napkin. Life was different then: phone calls were expensive and it took forever to travel on two-lane highways. My mother saved items like this to send to family members who could not attend. She clipped articles from the newspaper and sent them as well. 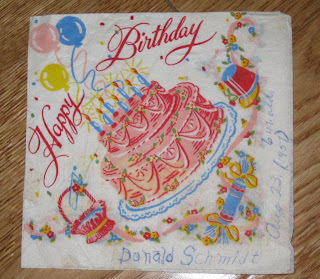 I do not remember attending many birthday parties when I was a child, but this napkin shows that I attended at least one. Don's family lived on a neighboring farm. Today, he is active in my church. I don't know what was so memorable about Christmas 1957, but Mom did. 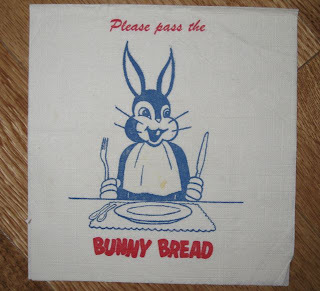 Do you remember Bunny Bread? Possibly, it is still available in other areas of the country, but I haven't seen it in Wyoming for more than 30 years. 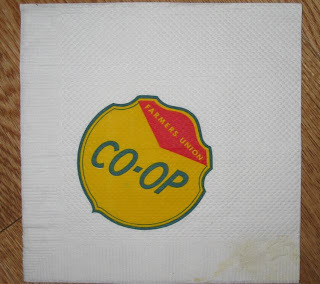 My parents were active in the Farmer's Union and the Farmer's Union Co-op. I remember attending evening meetings with my parents and have vague memories of working on projects for this group and attending picnics. There were membership pins that had exchangeable plates, which I think indicated the number of years the person was involved in the group. 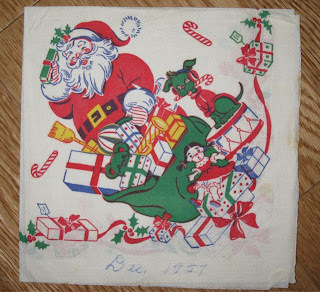 Even though I can explain this napkin collection, I cannot explain why I keep them. Even though one of my oldest unfinished projects (UFO) was 23 years old, it is not the oldest UFO in my house. 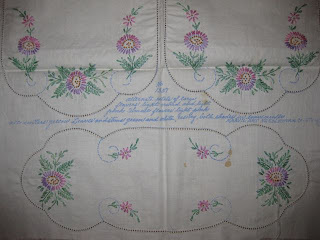 I have several linens my mother started and never finished. I suppose these two pieces are from the 1930's or 1940's. The one on the left is for a pillow and just needed to be seamed and stuffed. 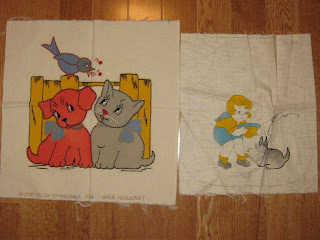 The piece on the right is for a child's bib, probably intended for one of my brothers. 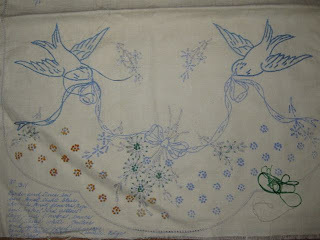 Only the birds and a few flowers have been embroidered on this dresser scarf. 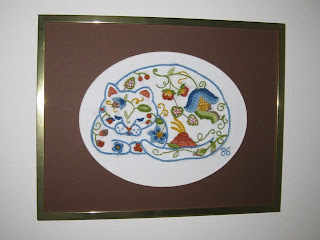 It is probably from the late 1950s or early 1960s My mother loved to embroider. I have numerous completed pillow cases and scarves that I still use. When I see them, I remember so many of the good times that we shared. This vanity set is nearly complete. The floss-color suggestions are printed right on the fabric. Mom did not crochet, yet many of her finished items have crocheted edging, probably done by a neighbor or friend. When I look at these incomplete projects, I am filled with sadness that the neglected objects will never be finished. I wonder if these pieces will be discarded once I am no longer their guardian, discarded by someone who did not know the woman who began them so long ago. She was my mother and my role model. 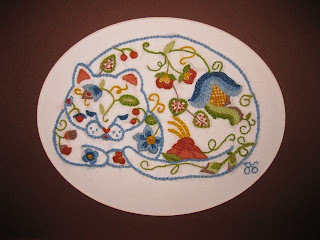 Do you have any needlework or handwork from your mother or grandmother? It usually doesn't take me 23 years to finish projects; however, this cat is definitely the exception. 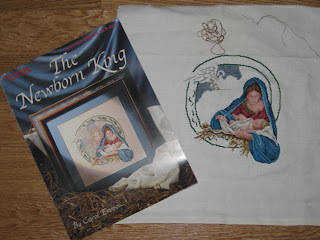 The actual crewel embroidery was finished in 1986. The kit was for a form-shaped pillow, but I did not like it that much. So, the cat has been sleeping in my cedar chest all that time. I purchased the materials necessary to frame the cat when I was in Denver. Yesterday, I decided it was time to finish this project that is well aged and Old Enough to Vote. What is the age of your oldest unfinished project? 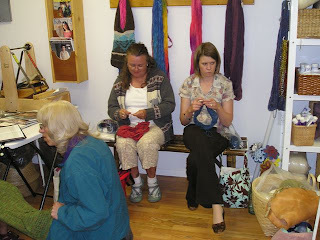 Sometimes the Tuesday Night Knitters meet at a small yarn shop owned and operated by one of our members. Her shop has a tempting variety of wool, roving, and knitting accessories, and she is always willing to answer technical questions. The knitters' projects range from socks and hats, shawls and sweaters, and pom pons and blankets. 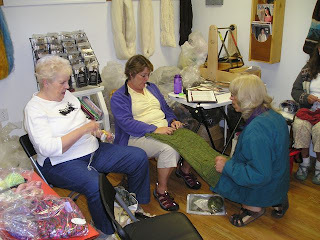 Julie and Nancy are participating in the Year of Lace program, and the green shawl was the first project. It featured cables resembling tree branches and trunks and knit out of a soft, fine yarn. The completed shawl will be light as a feather. Last year's projects are pictured here. Saturday and Sunday, I was able to do more knitting than I had originally planned. 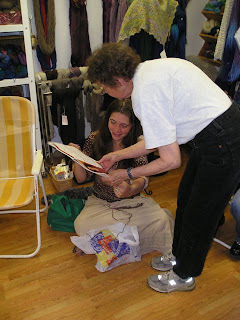 My friend Sue (whose husband was out of town for the weekend) needed some help at a Saturday rummage sale, so I spent nearly six hours knitting and visiting with her during the sale. Early Sunday morning (7:30 AM) Sue called and asked me to take her to the Emergency Room. She had fallen and thought she had dislocated her shoulder. From that point on, the next thirty minutes was filled with miscommunication and fear. I threw on some clothes and drove to Sue's house. The door was open, so I knocked and announced my arrival: she did not answer. With my heart pounding, I wandered from room to room only to find them empty. Where was she? I was in a panic until I noticed that the garage door was open and her car was gone. Thinking a neighbor had helped her, I went to the hospital to see if she needed any thing else done. No one at the hospital had seen Sue. Now, I was nearly frantic. I called Sue's cell and discovered that she had fallen at the Eagles club. I told her I would be there shortly to pick her up. Ummmm, I tend to have a heavy foot when I am anxious, and it wasn't long before I met a city police car. When he flipped around, I immediately pulled over to the curb. I handed him my license and admitted that I was speeding. With a shaky voice, I told him my story, and then I held my breath. Thankfully, he understood and let me go with a warning and a reminder to be careful. Before long, Sue and I were in the Emergency Room. Luckily, my knitting bag was still in my car, so I grabbed it after I parked the car. Then while I sat in the waiting room worrying about Sue, I knit. Once her shoulder was x-rayed, Sue was faced with the grim news. The shoulder was not dislocated: it was broken and broken badly. After three hours of being examined, x-rayed, and probed, Sue's shoulder was stabilized. The ER doctor gave Sue some pain medication, set up an appointment with a specialist on Monday, and sent us home. 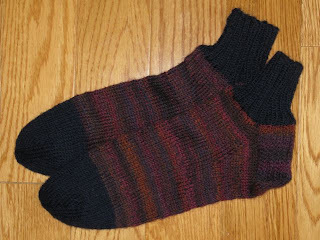 With all the extended time I spent with my needles, I finished a pair of short-cuffed socks that I began Friday night. Hopefully, the specialist will use his skill to "knit" Sue's bones back together. I pray that she has a speedy and easy recovery. Dreary weather motivated me to settle into my sewing room. I rummaged through the scrap bin and decided to make a few string blocks. 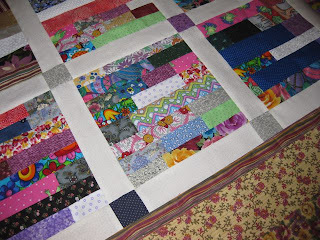 A "few" blocks ended up being 30 blocks as it was hard to quit once I saw the string pile diminishing. I depleted my stash of 1.5, 2, and 2.5 inch squares and strips. 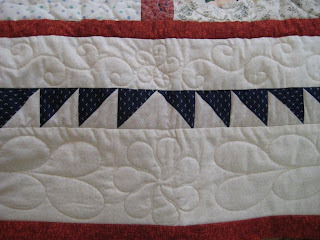 I even used half square triangles left over from the Bear Paw Quilt. 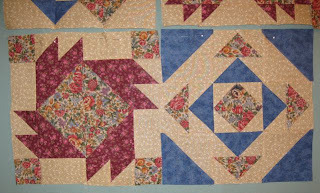 The sashing is also a remnant from the Bear Paw Quilt. I am proud to report that this entire quilt top, binding, and backing is made from my fabric stash. The only purchase I made was thread, and of course, the price of having it quilted. I am ashamed to admit that this project has been in my knitting bag since January/February when I was on a mission to eliminate my scrap balls of sock yarn. For months, this pair of socks has taunted me every time I opened my knitting bag. 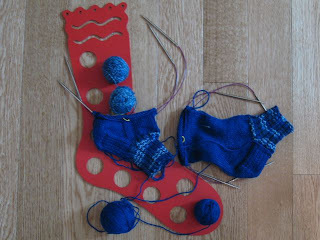 I just could not force myself to pick up the needles and finish the socks. Why? 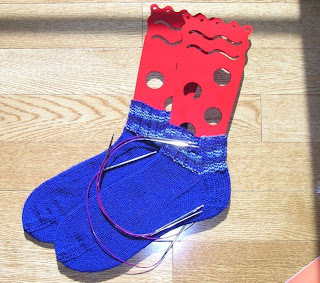 Who knows, I think I ran out of motivation for the project or simply had knit too many socks. Whatever the reason, this pair was first in the queue this week when the skies were dark and gloomy and when the clouds dropped buckets of rain. Yesterday, the sun came out, and I am glad to report that the socks are finished. 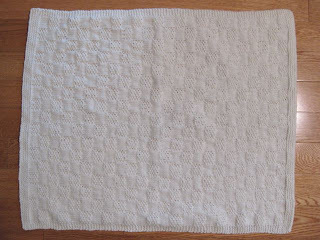 I have three projects presently on the needles: Lily of the Valley, cropped cardigan, and a T-shirt rug. What project have you been ignoring? 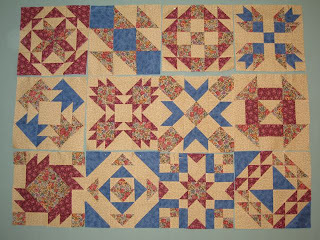 Okay, I know that it is not July, but the patterns for July's blocks were posted early, and I was in the mood to sew. Of the twelve blocks, the block on the left (Blackford's Beauty) is my favorite. It was an easy block to make, it didn't give me any frustrations, and it is attractive. I am trying to decide what kind of sashing (color, etc.) to put between the blocks. I am open to suggestions, so give me some ideas. After I finished the seed block preemie blanket, I cast on for another one. 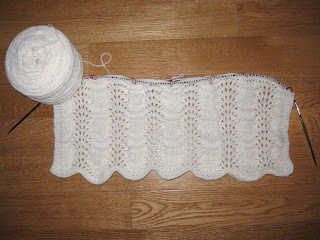 This time, I selected an old favorite - Feather & Fan for the pattern; however, the shawl pattern is called Shell & Wave. Even though pattern was written for a shawl, it adapts easily for a blanket: just cast on more stitches. I am very pleased with the looks of this little blanket. I may make a larger one next time. Summertime television does not interest me. The "new" shows are either extremely silly or plain boring, so last night, I decided to work on the Ugly Sampler blocks instead. Pick a Little (at left) and State of Illinois (at right) are the blocks for June. I love looking at old architecture and wonder who may have stood in the same location years ago. 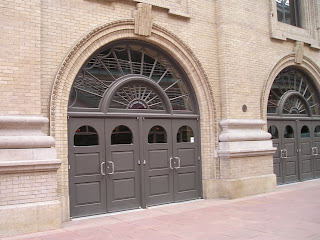 If these doors could talk, what secrets would they tell? Yes, I have been knitting, but not as much as I would like. I took my knitting bag to Colorado with me; however, all of the other activities didn't allow time for my needles. I did finish this preemie blanket for the West Coast Oddball project on Sunday. I used a seed stitch block pattern. This blanket needs a name. Any ideas?